Only a few days ago, she wanted nothing more than to be the fabulous Lucile. All that she had dreamed about and hoped for had been delivered to her. She had moved into the orbit of the woman she most admired. She took a deep breath, trying to resist the echo of her father's voice in her head: Don't put on airs, he always scolded. You're a farm girl, do your job, keep your head down. You get decent enough pay; mind you don't wreck your life with defiance. 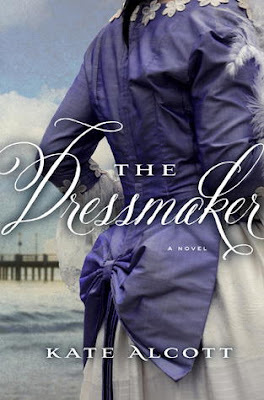 A beautifully written, moving and mesmerizing novel, The Dressmaker by Kate Alcott elegantly weaves facts and actual historical figures into a fabulous story of new beginnings, determination, talent, passion and love. Breathtaking and glamorous, it's not only a riveting account of Titanic's fatal voyage, but also a spellbinding exploration of what happened to the survivors after the tragedy. Classy and deliciously readable, it's a book that will draw you in with its addictive atmosphere, swiftly moving story line and totally absorbing passages. Tess Collins has always dreamed of becoming a professional dressmaker. She's got all it takes to be one of the best: determination, precision and talent. Now all she needs is a fresh start, someone who will give her a chance to prove herself. Tired of working as a lowly maid, and being constantly mistreated and underpaid, she decides to quit her job and try her luck somewhere else. When an opportunity presents itself for her to travel to America, Tess does not think twice. Hired to be a personal maid by the world's famous designer, Lady Lucille Duff Gordon, she boards the breathtaking Titanic - her heart filled with excitement, expectations, and hopes for the future, not for a moment expecting this journey to end so tragically, and not only because of the sinking itself, but also everything that followed after. It wasn't until I finished reading this book and - itching to read more about the sinking of Titanic and the fates of its survivors - started researching the past, that I found out Lady Duff Gordon, as well as her husband, Cosmo, and sister, Elinor Glyn were all historical figures. Their story - from them being in a lifeboat that only had 12 people in it (including the crew), all the way to the devastating trial - absolutely and painfully authentic. 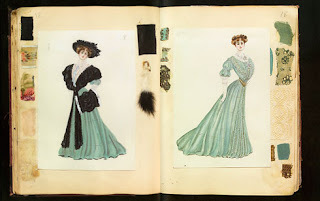 I quickly became fascinated, craving to learn more about the book's intriguing historical backdrop, Lucile's fabulous and world-famous designs, and - perhaps most of all - about her flambuouant personality. Kate Alcott's book was undoubtedly very thoroughly researched. Her account of the events - impressively accurate, detailed and lively. With her exceptionally captivating prose, and simple yet descriptive language, she really brought all the characters and locations to vivid life, allowing us to travel back in time to 1912. And what's even more amazing in my opinion, is the fact that not only we can re-live the tragedy of Titanic's sinking, but also look far beyond that, to see what happened to the survivors, and how that one unforgettable night changed their lives forever. I really enjoyed following Tess' adventures. I found her quite likeable and genuine. She was full of burning passion and knew exactly what it was she wanted to do with her life. I admired her perseverance, loyalty, dedication and spirit, but also the fact that she wasn't afraid to stand up for herself and fight for her future. Good-natured, forgiving, patient and understanding, she was easy to connect with. I found myself cheering for her, wanting her to achieve her dream and become a well-appreciated designer - she worked hard for it and absolutely deserved it. Tess was a fictional character, but to me she was no less real than Lady Duff Gordon or Cosmo. Her fears, dreams and hopes for the future were universal ones - anyone who ever wanted something really badly, and worked hard to achieve it, will find themselves relating to Tess' story. What I loved the most about The Dressmaker, is the fact that Kate Alcott didn't focus on Titanic's sinking. After all, as fascinating and bone-chilling as it is, we all know the story by now, and dedicating yet another book to the famous ship's maiden's voyage would be utterly pointless and redundant. Thankfully, Kate Alcott decided to explore something that is no less exciting and thrilling than the tragedy itself - everything that happened AFTER. And there was a lot to write about. The trials, accusations, bribery, unexplainable cruelty of those who did not go back to try and save more people from certain death. Alcott wrote about morality, retribution, guilt, bravery, socially unacceptable behaviour and its consequences. This book is not so much a story of Titanic and it's passengers, as it is a study of human nature and trial of human soul. It's brilliant. It shines a whole new light on the story, exploring the pain, heartbreak and loss that was not caused by Titanic's collision with the iceberg, but by human decisions and actions. I had a fabulous time reading The Dressmaker. If you could only read one book about Titanic and it's passengers - pick this one. Absolutely and utterly masterful, Kate Alcott's novel has everything you'd expect from a good read: compelling settings, fascinating characters, emotionally engaging and thrilling plot line, elements of drama, romance and action, and - perhaps most of all - a historically accurate account of events surrounding and following the sinking of Titanic. I strongly recommend this book to everyone! 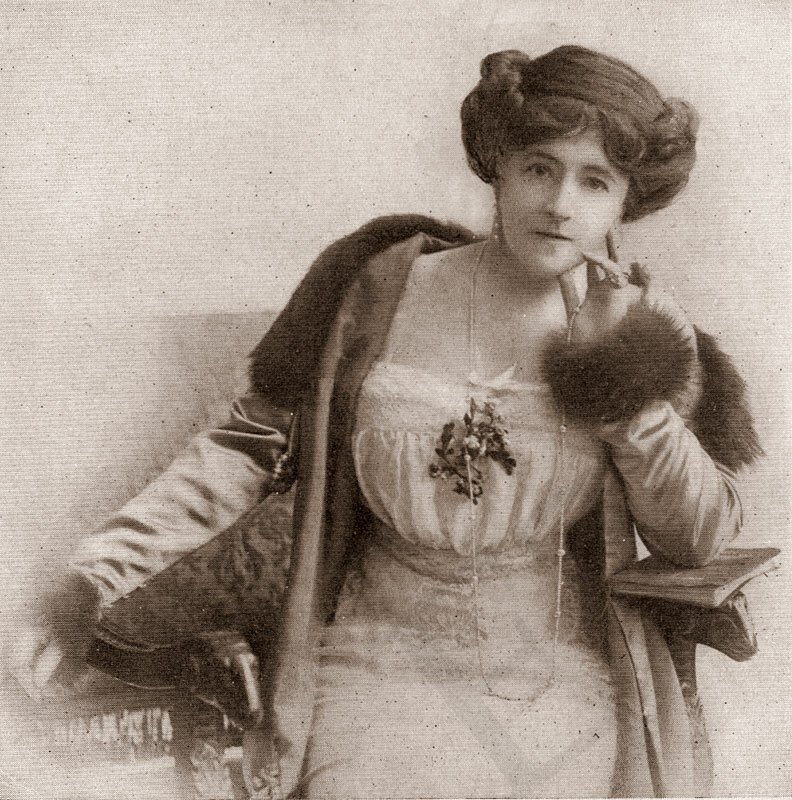 In 1900, she married her business partner Sir Cosmo Duff-Gordon, who helped her to manage and grow her business into a worldwide success. 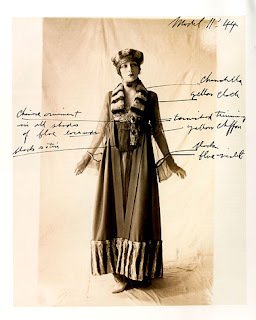 'Lucile' designs developed a following of wealthy women including royalty and popular actresses of the time, and the Lucile company eventually opened salons in New York, Paris and Chicago by the early 1900s. 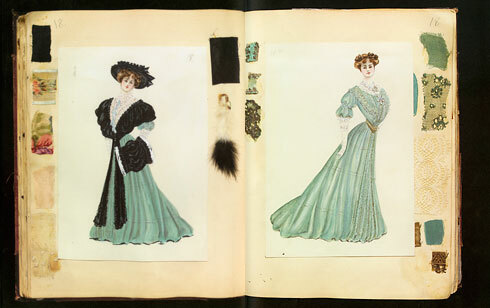 Lucy also designed the clothing for Theater productions and silent movies. 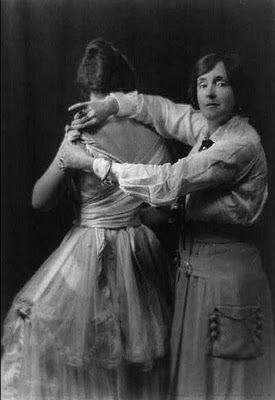 Lucy is said to be the first designer to stage a runway fashion show with live models that she trained to walk in her clothing. She wrote fashion columns for newspapers and Harper's Bazaar for many years during the teens. She also did a ready-wear collection that was sold by mail order through Sears around in the late teens. Young designers like Howard Greer and Edward Molyneux worked for her. She designed elegant daywear, eveningwear and lingerie. Another part of her fame involves the Titanic. Lucy & Cosmo were passengers on the Titanic, she was even referenced in the Titanic movie as being the designer of 'naughty lingerie' . Lucy, her secretary and Cosmo were in a lifeboat that only had 12 people in it, including several crew men. Money changed hands between Cosmo and the crew men. Cosmo was accused of bribing the crew men to let him on the lifeboat but the Duff-Gordons claimed that the money was a generous gift to help the crew men until they found new jobs. In the late Teens, Lucy lost the rights to her own name in a legal battle. A restructuring of the Lucile company was done, and Lucy lost control of the designs and was unhappy with the quality of the clothing being produced. She left the company that she founded in the early 1920s and it failed shortly after. 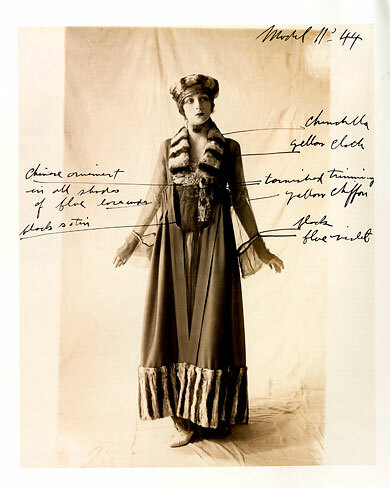 In London, she designed for a small private clientele under the name Lady Duff Gordon for a short time. After the death of her husband, she was said to be struggling financially. She died at age 71 in a London nursing home in 1935. Hey it's Lisa from Book Mark Belles just stopping by to say hello your blog is friggin amazing! Evie, what an amazing review! I love that you included the historical details as well. I am a huge historical fiction fan and love to read about the Titanic. I had no idea that this book was actually rooted in fact, and that fact that Lady Duff Gordon was a real historical fiction figure makes it so much greater for me. You are so right, rarely (if ever) do I come across a Titanic book that takes place after the tragic event. This book sounds like it has so much going for it, and I am SO excited to read it. This is definitely a must read (just as soon as contemporary month is over!). Bonnie, your comments always make my day! i can't thank you enough for taking the time to stop by and leave a trace of your fabulous presence! I hope you know how much I love and appreciate you <3 You are my biggest motivation and greatest friend a person could have!!!! Thanks so much for stopping by! I'm very excited to have found your blog, too, and can't wait to meet the both of you, lovely gals! Lets grab a coffee sometime soon! This looks like a great read. Historical Fiction is a favourite of mine. i enjoyed the review. I hadn't heard of this book before and it sounds amazing. I'm definitely going to have to look for this book, I'm looking forward to reading it. Thanks for visiting, sweetie! it's always so nice to see you drop by :) Love your comments! I am 100% sure you'll love this one just as much as I did! Do pick it up! And please make sure to let me know what you thought about it after you read it - I'm excited to hear your thoughts! Thanks for sharing your review, if not for you, I wouldn't have known about this book. Really gorgeous review. I'm just stunned that I never heard of this before. I've always been fascinated by stories relating to/involving the Titanic, and I think this would be particularly fascinating because it, as you said, does not focus on the sinking itself but all the devastating aftermath. I will definitely have to look for this one. I haven't heard of The Dressmaker before, but I will definitely be making sure to check it out. It looks really good! I have never heard of this book before but after reading the review I think it must be amazing. So adding this to my endlessly to-read list! Ooh, this sounds fabulous! I love historical fiction, and I'm fascinated by the Titanic, so this book sounds especially good to me. :) And your review was fabulous! Thanks so much for the recommendation - this is going on my to-read list for sure!